Oct. 22, 2017 2:30 p.m. The rental crunch across B.C. is proving to be a barrier for many residents looking for adequate and affordable housing and it’s even worse for those with animals. Pets OK BC, backed by 10,000 paper-petition signatures, is calling on the provincial government to end no pet policies in the Residential Tenancy Act, used by landlords and stratas. The idea is that amending the act with the proposed Quiet Enjoyment provision could bring some relief to those searching for homes in cities with already low vacancy rates like Vancouver, Kelowna and Victoria. 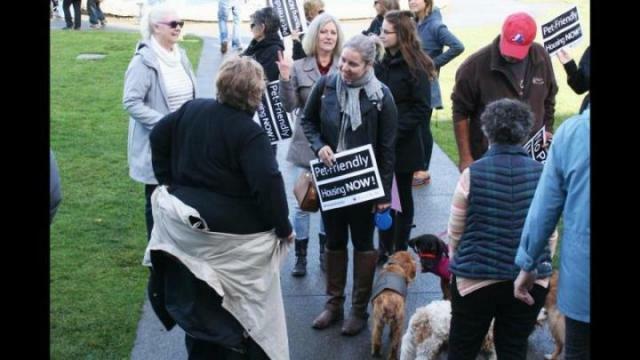 A few dozen supporters were outside the Legislative building in Victoria Sunday to celebrate the petition being brought forward to the province. In Ontario it’s been illegal for landlords to discriminate against renters for having a pet since 1990. According to Pets OK BC, approximately 1,700 animals were surrendered to the BC SPCA last year due to housing or related issues. “The new provincial government, under the leadership of Premier Horgan and Housing Minister Selina Robinson, has a moral obligation to act in defense of families with pets, in a manner that respects the value of human rights over the value of private property and profits,” the group said in a statement.